Jointly built by the Ministry of Finance, the Ministry of Education and the Shandong Provincial Government, Shandong University of Finance and Economics (SDUFE) is situated in Jinan - a nationally famous, historic and cultural city, enjoying a good reputation as the “Spring City.” SDUFE IS a university of finance and economics with a long history. It is a large-scale university with distinctive administrative characteristics. It mainly focuses on economics and management. It includes the other six disciplines: literature, law, science, engineering, education and art. It has a high reputation and is popular both at home and abroad. Shandong University of Finance and Economics (SDUFE was established on July 4, 2011 through the merger of Shandong Economic University and Shandong University of Finance and was officially unveiled and founded on June 9, 2012. It received congratulations from the party and state leaders such as Li Lanqing, Jiang Chunyun, Wang Bingqian, Chen Zhili and others. The predecessor of Shandong Economic University, Shandong College of Finance and Economics, was established in 1952 through the merger of Shandong Accounting College and the Department of Economics in Qilu University. It is the earliest financial university in Shandong Province and one of the earliest colleges and universities of finance and economics in China. During the “Cultural Revolution,” the operation of Shandong College of Finance and Economics was suspended. In 1978, with the approval of the State Council, it resumed its schooling, and it was renamed Shandong Economic University. In 1993 it acquired the right to grant masters degrees. Founded in 1986, Shandong University of Finance was an ordinary college of higher finance and economics, jointly founded by the Ministry of Finance and the Shandong Provincial People's Government. In the early stages of the school’s organization, a leading management system was implemented with mutual administration by the Ministry and the Province and with the Ministry as the primary administrator. In 1998, it acquired the right to grant the masters degrees. After 2000 the school’s leadership and management system was transformed into a leadership and management system built by both the central and local governments with local management as the main manager. 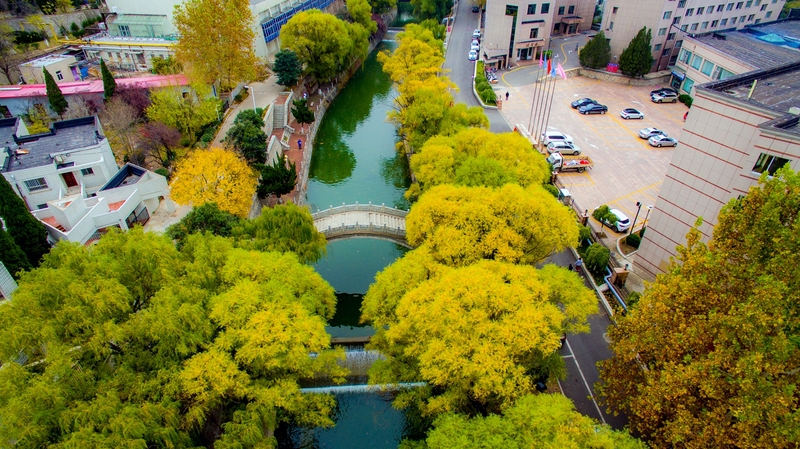 Covering a total area of 3,264 mu, SDUFE has four campuses in Jinan, including Yanshan Campus, Shungeng Campus, Shengjing Campus, and Mingshui Campus. Laiwu Campus in Laiwu City covers an area of 800 mu and enrolls students by itself. It has a perfectly modernized teaching infrastructure and excellent experimental equipment. There are over 150 various laboratories and over 170 various practical teaching bases. There is one national experimental teaching demonstration center, three experimental provincial teaching demonstration centers for teaching core subjects, 26 provincial experimental core subjects for provincial universities and colleges, and 11 provincial key laboratories. The total area of the school buildings is 1,192,000 square meters, and the total value of teaching spaces and scientific research instruments and equipment is 230 million RMB. The library has 2.7 million books, 9.678 million e-books, and 362 databases. It has realized a sharing of book resources with provincial and municipal libraries. There is a modernized broadcasting center, a CATV teaching system, and a Gigabit Ethernet campus network system. Currently, as a university of finance and economics with the largest scale of schooling in China, SDUFE has more than 33,000 full-time undergraduates and postgraduates. There are 24 teaching institutes (departments) and 60 undergraduate specialties. It has four first-level discipline doctoral degree authorization centers in applied economics, business administration, management science and engineering, and statistics, and ten first-level discipline master degree authorization centers and 14 master’s degree categories, such as MBA, MPA, etc. It has three first-class disciplines in Shandong Province, including applied economics, management science and engineering, and business administration under project construction. On December 28, 2017, the Degree and Postgraduate Education Development Center of the Ministry of Education announced the results of the fourth round of subject evaluation, in which two first-level disciplines - applied economics and business administration - were B+ and two first-level disciplines - management science and engineering and public administration - were B-, making SDUFE one of the three universities in Shandong Province with more than two B+ disciplines and the only provincial-owned university with B or above in economic management disciplines in Shandong Province. With its overall disciplinary strength, it has entered the top ten universities of finance and economics in China. ●fifty-six provincial-level top quality courses. ●Forty-five awards for achievement in teaching and research at a provincial and ministerial level or above were awarded. Among these one received a second prize at the national level. ●Seventeen provincial second prizes were awarded. It won repeated prizes in the national and provincial “Challenge Cup,” “Creating Youth,” “the Mathematical Contest in Modeling,” “the Academic Paper Competition,” and “the CCTV English Speech Competition.” In 2016, it won three gold medals in “the National Entrepreneurship Competition” of “Creating Youth,” ranking at the front rank in the country and first in Shandong Province. It won the grand prize and the first prize in the competition for innovation and entrepreneurship among the national institutions of finance and economics, ranking the first. The University Students’ Entrepreneurship Park was evaluated in 2016 by the Ministry of Education as the “Demonstration Base for Innovation and Entrepreneurship in Practical Education at National Universities.” Graduates of our university have been highly appraised by employers and the society for many years. The quality and level of employment have steadily occupied the forefront of colleges and universities in the province. Our school has been listed in the “List of Top 100 Colleges for Competition among Graduates for Employment, issued by BOSS Zhipin for three consecutive years; and it is the only one among the provincial universities. In 2017, it ranked the 71st place in the country, ranking three places higher than in 2016. ●286 projects at the provincial and ministerial level. ●"Internet Plus" Accounting Development Collaborative Innovation Center. SDUFE has also undertaken to construct 28 provincial scientific research innovation platforms, including the Shandong Provincial Governmental Regulation and Economical Social Development Research Base. The school has published the two academic journals comprised of the Economics and Management Review selected from the source journals of the extended edition of 2017-2018 China Social Science Citation Index (CSSCI), the 2018 core journals of Peking University in Chinese, and the Journal of Shandong University of Finance and Economics. In 2017, it had a total of 25 approved items as annual projects and youth projects funded by the National Social Science Fund, ranking 45th among universities, second among the institutes of finance and economy, and the first among the provincial colleges in China. In 2018, it has total 22 National Social Science Fund projects, ranking second among the provincial colleges, and for the first time it also won the first prize for Progress in Science and Technology in Shandong Province in the same year. Established multi-level, multi-form and substantive cooperative and collaborative relationships exist with more than 60 universities and educational institutions in the United States, the United Kingdom, France, Canada, Germany, Australia, New Zealand and other countries. SDUFE is one of the founding members of the Association of Sino-Russian Economic Universities (ASREU) and one of the 12 universities in the Association of Asia-Pacific Business Schools (AAPBS) in the China mainland. SDUFE has cooperated with the University of Minnesota, Napier University, the University of Rennes, Dalhousie University, Unitec Institute of Technology, Prague University of Economics, Tokyo University of Economics, Tamkang University and other universities at home and abroad. It has selected and assigned hundreds of students to visit overseas or to study in graduate programs so as to acquire a double degree education as undergraduates and postgraduates. At present, more than 200 international students from more than 30 countries in the world have come to the university to study for doctorate, masters, or bachelors degrees or to engage in advanced studies related to languages and disciplines. It has established a comprehensive strategic partnership with Shandong University, Southwestern University of Finance and Economics, Shandong Academy of Social Sciences and other institutions. In recent years, it has cooperated with the Liaison Office of the Central People's Government in the Hong Kong Special Administrative Region, with the Department of Finance in Shandong Province and with other institutions to hold various forms and levels of training classes, to secure good economic and social benefits.